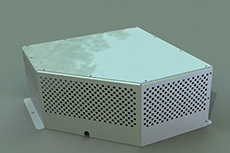 PEM Sheet metal Ltd offers a CNC Forming service. 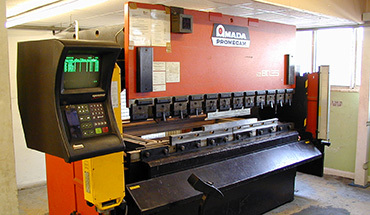 We operate 4 Amada computer controlled press brakes with capacities of up to 80 tons force over 2.5m. This gives us the capacity to accurately fold metals up to nominally 6 mm thick. We have a wide selection of tooling available for these machines allowing us to produce complex forms and to minimise ‘witness’ marks in softer materials such as aluminium. 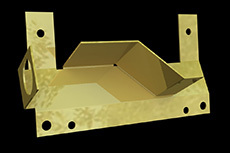 Sheet metal forming is a discipline that even with the latest CNC equipment still requires an extremely high level of operator skill and experience to produce repeatably good results. PEM recognises this and employs the staff with the highest levels of skills available. Advanced 3 dimensional CAD analysis before production minimises the instances of work piece / tooling conflicts and ensures that design rules are followed for particular materials, this helps to eliminate the chances of cracking at the forming stage. We regularly work with all common sheet metals such as mild and stainless steels, aluminium and yellow metals such as brass, copper and phosphor bronze. We also have many years experience with more exotic metals such as beryllium copper and titanium. 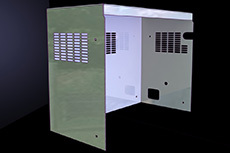 Our experience ranges over a wide range of products from simple brackets and PCB hardware such as screening cans, up to specialist fabrications, cases, cabinets, electronics racks and full enclosures systems.